And so to America and the Declaration of Independence. An unnamed minister from Ulster is recorded as working his ministry in Maryland in 1668. The Rev William Trail of Lifford went to Maryland in 1682 and officiated there for several years. A Rev John Makie, from St Johnston, Scotland went there in 1690 and in Delaware the Rev Samuel Davis, from Ireland, ministered to a growing congregation. In 1705 another Irishman, John Hampton from Burt, joined the ministry in America. Thus by 1706 Francis Makemie was able to organise the first American Presbytery - that of Philadelphia. Rev Francis MaKemie (1658-1708) is usually credited with being the first to organise Presbyterianism in America although it must be said that his task was made easier by the endeavours of others before him. He was licensed in 1682 by the Lagan Presbytery and went first to the West Indies before arriving in the American colonies about 1684. His was not an easy task, not only having a widespread congregation, but hindered by the local governors who enforced the English laws according more to their whim than the statute. McKemie was arrested in January 1707 by the Deputy Governor in New York, an Episcopalian by faith, for allegedly preaching without authority - choosing to ignore the Toleration Act. Yet another Ulsterman to make his contribution to America was William Tennent, later to be called ` the father of Presbyterian colleges in America`. In 1716 he founded his famous `Log College` at Neshaminy which soon gained an enviable reputation and said to resemble " one of the school of the prophets more than any seminary." He was followed in 1718 by the Rev James McGregor, minister of Aghadowey, who with members of his congregation from Macosquin and around Londonderry and Coleraine, established the town of Londonderry in New Hampshire. So began a new phase among the Ulster-Scots settlers in America in which some 300,000 discontented Presbyterians from Ulster settled in the New World between 1717 and 1776. The early years of the 18th century was one of continuous physical disaster that impacted the already struggling farmers who were having problems with tenancies. Many tenancies were for two or three lives thus by the early 18C the tenancies of the Plantation settlers were subject of review, while any renewal invariably meant a substantial increase in rents This description from Ulster Sails West by William F. Marshall. Baltimore, MD: Genealogical Publishing Co., Inc. 1950. pg 10-11: sets out the dreadful state of affairs. "It is not, however, contended here that religious intolerance was the only factor or even the only important factor leading to emigration. There were six years of drought between 1714 and 1719. There was disease that caused a high death-rate in sheep in 1716. There was an outbreak of small-pox in 1718. There was a scarcity of silver and copper coin that hampered trade. The woollen industry had languished, and the linen trade was not flourishing. There were three bad harvests in 1725, 1726, and 1727, that in 1728 the price of food was higher than in living memory and the minister of Templepatrick declared that there was not seed enough to sow the ground. There was the great frost in 1739, followed by famine and disease, and Gordon states that in 1740 the mortality caused by scanty and improper food was very high. There was a failure of the potato crop in 1756-7. Then there were the very high rents the consequent increase in tithes...." Another important factor was that increased rents also meant increased tithes (usually related to the value of the land which they had improved) which were paid to the Church of Ireland, much to the chagrin of the Presbyterian farmers. The tide of migrants to America gathered strength from about 1729 and by the second quarter of the eighteenth century it is estimated that some 12,000 people annually left Ulster`s shore. In the five years 1768-73 it was computed that Ulster lost ` one fourth of its trading cash, and the like proportion of the manufacturing people`. The vast majority were Presbyterians, driven by intolerant landlords, prejudice and bigotry to take their chances in the New World. It is ironical, perhaps even justice, that the nation that denied them the means of earning an honest living would be harshly punished in the latter years by these same men prominent in wresting America from the rule of Britain. In that struggle Presbyterian ministers - John Rodgers, James Caldwell, Alexander M`Whorter, George Duffield and Patrick Allison were all sons of Ulstermen. Within the church it was 1752 before the supply of a permanent preacher would be met in America, meanwhile the Rev John Cuthbertson was diverted from his appointment to America to preach in Ireland. Cuthbertson soon went to America landing in Pennsylvania in August 1751 then to spend the next 22 years visiting the Societies and preaching to the Presbyterians in Pennsylvania and New York. So a new link was forged that would see the Ulster Scot Presbyterians making their own Declarations of Independence such as ` The Hanover Resolves ` in Lancaster Co., Pennsylvania on 4 June 1774 ; and ` The Mecklenburg Declaration`, at Charlottetown, North Carolina on 31 May 1775. From these came the format that Thomas Jefferson used in preparing another Covenant - the Declaration of Independence 4 July 1776. 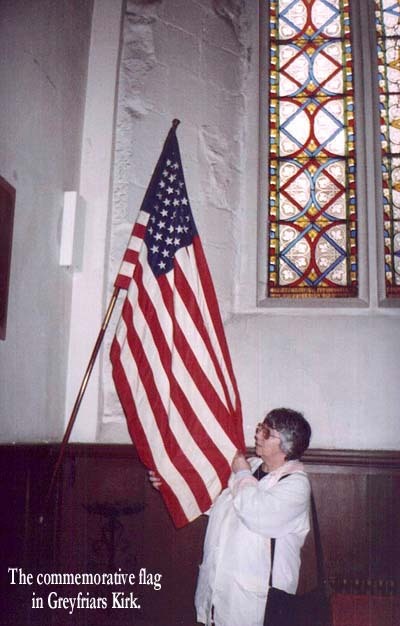 It is no coincidence that in 1970 a commemorative flag was presented to Greyfriars Kirk, the `home` of the Covenanters, by the United States Consul marking the fact that the church was consecrated in 1620 - the same year the Pilgrim Fathers landed in the New World.